Welcome to HYPERBRAWL TOURNAMENT, the most intense SPORT BRAWLER game you’ve ever played! Assemble your team of formidable warriors, arm them with game-changing weapons and compete to become the Galaxy’s greatest hero! HYPERBRAWL TOURNAMENT fuses ‘no-rules’, hyper speed handball with brutal player-versus-player combat. Challenge your friends or the A.I in intense 1v1 or 2v2 local or online conflicts. 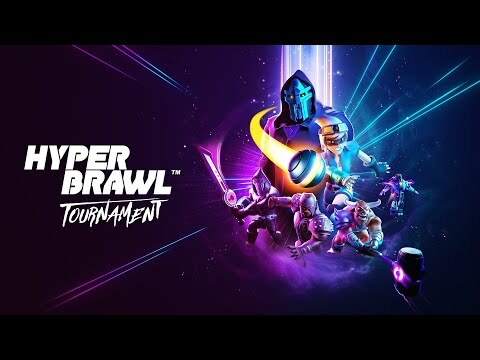 Only HYPERBRAWL TOURNAMENT gathers the greatest warriors from across time and space and pits them against each other in a visceral and brutal sport. Select your hero and match with a unique weapon to create a formidable combatant, distinctly suited to your play style. Play on your own, go up against friends on-line or in couch play. Or take on the world in one of HYPERBRAWL TOURNAMENT’S three modes: throw yourself into the single-player ‘Galaxy League’ mode to perfect your every move, from subtle after touches to fury fuelled ‘rage’ attacks; blast into multiplayer action in the unranked ‘Gauntlet’ mode; or prove yourself in the ranked HYPERBRAWL TOURNAMENT to become the Champion that defines the age! 8 game changing weapons! Wield the earth-shattering Hammer, destructive Proximity Mines, or rain Hell from above with the jetpack!